As of a few years ago, it was calculated that more than 23 million passengers use the Indian Railways as a means of commute. To tend to the needs of this colossal number of people, the Railways are currently the nation’s largest consumer of electricity and diesel. It was estimated that this sector spent a whopping 31,000 crores INR ($310,000 million), in 2016, on fuel alone. 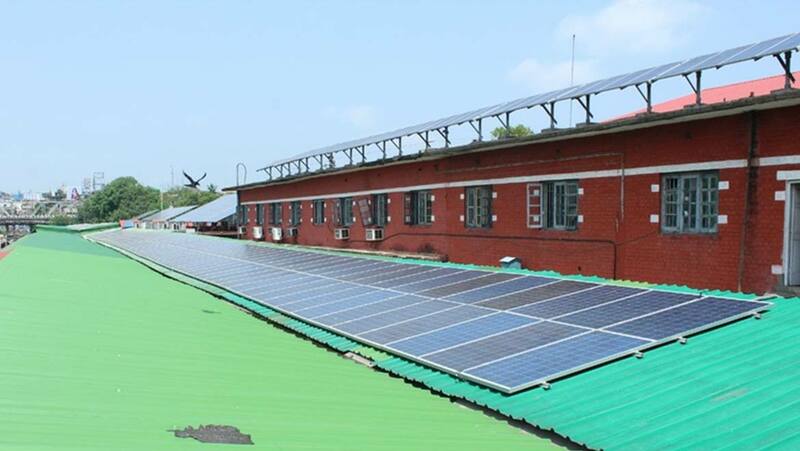 To address this concern and bring down costs, the state government of Guwahati (a city in Assam, India) has resorted to installing solar power in the form of panels in their major train station. The project was commissioned in April 2017, and it was labeled as the first complete solar-powered railway station in the northeast of the country. It has been calculated that the Guwahati railway station, located prominently in the north-east region of India, sees an average of 20,000 passengers per day. The station has been designed accordingly with 2352 grid-connected, rooftop, solar energy modules with a capacity of 700 KW (kilowatt). Since its installation, the plant has generated more than 700 KWh worth of power with an output rate of about 2000 KW/hour. The network has, thus, saved approximately $100,000 per year in electricity bills. An interesting aspect of this system is that it was not a “standalone” but instead, grid-connected. This means when there is a shortage of energy generation, power is drawn from the grid, and vice versa. Sharma also talked about this project being part of a larger concept to substitute regular lights with LEDs, which could be more energy-efficient for the station. The solar-powered station was designed to reduce the carbon footprint, along with power costs. It was observed, during the year, that 6.3 lakh kg (630 metric tons) of CO2 emissions were cut. In July of 2017, a set of train coaches (with transit in New Delhi) with rooftop solar panels were tested by the government. This resource supplied power to all the amenities and systems inside the trains. Results of this prototype showed a reduction in diesel cost of 12 lakhs (~$17000) per year. 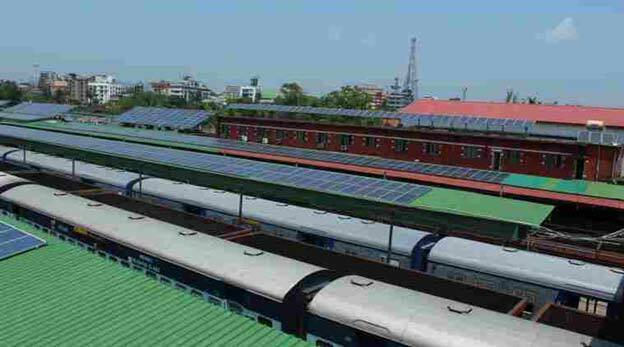 By 2025, the Indian Railways plans to meet 25% of its energy needs through renewable energy, i.e., install 5000 MW (megawatts) of solar power in the railway station. After a year of functioning, this project can be considered successful and a big step towards the conservation of renewable resources and the environment. This million-dollar undertaking, by the state-run engineering company in Sahibabad, Central Electronics, was funded by CONCOR (Container Corporation of India), an entity of the Ministry of Railways. This corporation is also responsible for other businesses such as cargo, and terminal and warehouse operations. The NFR (Northeast Frontier Railways) has plans to extend this “green” program into other cities in the north-east of India, such as Nagaland, Mizoram, and Manipur. Currently, train stations in the smaller cities of India, such as Jaipur, Mangalore, and Thiruvananthapuram, are only partially powered by sun and wind energy. With this, Guwahati has set a certain standard that local governments across the nation, and the world, could emulate for a cleaner, more sustainable future.